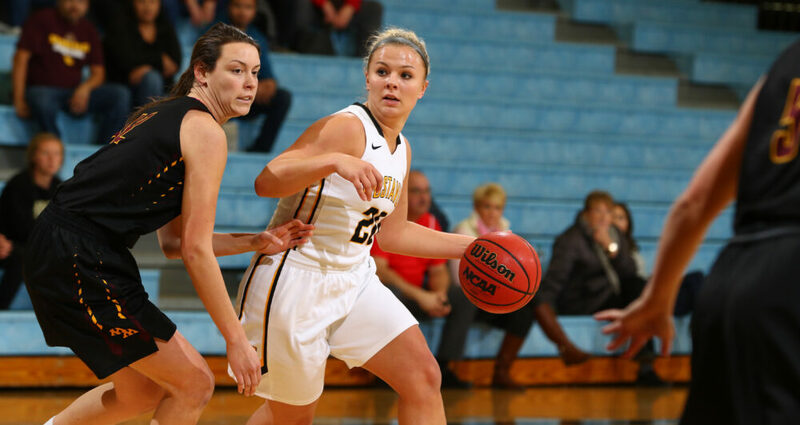 SAINT PAUL, Minn. – The Gustavus women’s basketball team got back in the win column Wednesday night, defeating Macalester 74-65, improving to 8-8 overall and 5-4 in the MIAC. After watching their lead late in the game dwindle down to one point, the Gusties were able to stop the Macalester rally to preserve the victory. Kendall Thompson (Sr., Eden Prairie, Minn.) was key for the Gusties, scoring a career-high 25 points on 8-of-19 shooting, including 7-of-8 from the free throw line. Thompson was one rebound shy of a double-double, while adding four steals, three assists, and two blocks. Macalester started the game with the hot hand, jumping out to a 14-5 lead in the first five minutes. The Gusties responded with a 12-3 lead to end the first quarter tied at 17. The Scots regained the lead to begin the second quarter, but once again the Gusties answered with an 11-5 run to close out the half and went into the break up 37-36. Gustavus never relinquished the lead and was ahead by as much as nine points (51-42) midway through the third quarter, but the Scots battled back into the game and trailed by one (66-65) with 2:46 left in the contest. The Gusties were able to fend off the home team’s rally with eight unanswered points to end the game. Ava Gonsorowski (So., Esko, Minn.) joined Thompson with a career-high of her own, totaling 13 points. The Gusties forced 18 turnovers and tallied 11 steals. Rebounds were even at 42 apiece. Gustavus next hosts Concordia at 1 p.m. Saturday.